As one of the most aromatic spices, cumin gives off a pungent earthy aroma that is warm and almost sweet with hints of pine and lemon. Flavor experts, that's what Karen Page and Andrew Dornenburg are. Having studied ingredient compatibility and flavor with endless zeal, an innate curiosity about flavor and food clearly drives their passion for research. After carefully picking the brains and culling wisdom from hundreds upon hundreds of world-class chefs and culinary thought leaders, they have distilled their findings into numerous award-winning books that can only be described as essential culinary reference works. Karen Page and Andrew Dornenburg's work is about understanding the natural affinities between food and drink, taste and technique, tradition and creativity. It's an honor to have such flavor experts share a little Spice Inspiration for using cinnamon in savory dishes. "We love cinnamon for its delicious versatility -- it's fantastic in both sweet and savory dishes, and marries well with everything from apples and chocolate to lamb and pork. Cinnamon is as great in beverages as it is in food -- it lends its aromatic sweetness to everything from egg nogg to apple cider mill martinis. We kick off most days with a mug of cinnamon tea, and in the wintertime we'll often boil a pot of water on our stove with a stick of cinnamon thrown in because we love the way it smells. Though it's often thought of as a "winter" spice, it's invaluable year-round -- in barbecue sauces, or to bring out the "blueberry-ness" of blueberries in blueberry pie. It can take you around the world, from all-American apple pie to Mexican moles to Indian curries to Moroccan recipes like this favorite of ours from our book, The New American Chef." (John Wiley & Sons, 2003). Recently cited as two of a dozen "international culinary luminaries" along with Patrick O'Connell, Alice Waters, and Tim and Nina Zagat (in Relais & Chateaux's L'Ame et L'Esprit magazine), the award-winning authors Karen Page and Andrew Dornenburg have written several groundbreaking books chronicling and celebrating America's culinary revolution. What to Drink with What You Eat, Becoming a Chef, Dining Out, and The New American Chef were all winners of or finalists for Gourmand World Cookbook, IACP, and/or James Beard Book Awards. In March 2007, Page and Dornenburg were named weekly wine columnists for The Washington Post. Karen Page is a graduate of Northwestern University and the Harvard Business School. Andrew Dornenburg studied with the legendary Madeleine Kamman at the School for American Chefs, and has cooked professionally in top restaurants in New York City and Boston. The couple resides in New York City and can be found on Twitter at @KarenandAndrew. It wasn't until a few years ago that I began to appreciate what cinnamon can do for poultry and meat, or any savory dish for that matter. I'd been enjoying the effect of cinnamon in many foods I ate without realizing it was cinnamon sweetly tempering a jerk seasoning, or adding a warming depth to curry sauce. If cinnamon in savory foods is a new idea to you, the recipe for Cornish Hens with Pomegranate Honey and Roasted Almonds may just launch you into whole new culinary adventure. This recipe comes from Andrew Dornenburg and Karen Page's book The New American Chef. The premise of the book is to introduce the core defining elements of ten world cuisines. Turning to experts on each topic they share flavors, cooking techniques and key ingredients authentic to each cuisine. If you've ever had fusion food that's gone terribly wrong you will deeply appreciate this book. Over and over the master chefs they interviewed pointed to a lack of understanding of specific cuisines as the root cause of fusion-disasters. 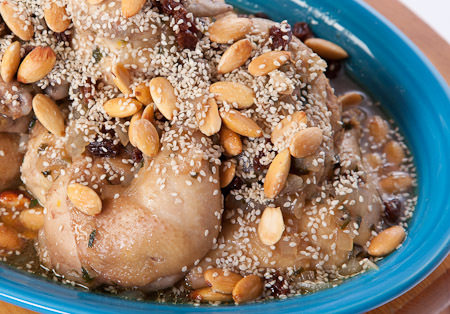 Cornish Hens with Pomegranate Honey and Roasted Almonds comes from the Moroccan chapter. Every chapter is woven together with the cultural aspects that surround food and eating. They learned from Chef Rafih Benjelloun, who owns Imperial Fez in Atlanta, "The most important thing about enjoying Moroccan food is to slow down while you are eating - as well as while you are cooking. Make mealtime a family experience as we do back home." They describe hospitality as the cornerstone of this cuisine. So when I made this recipe I invited friends over and we had a wonderful impromptu dinner party. I served what might be the most iconic Moroccan ingredient, couscous, alongside the game hens. I'll admit that I didn't cook the couscous using the proper Moroccan steaming technique, but I do intend to change my couscous ways in the future. The contrast of tart and sweet playing between the pomegranate and honey define this dish. The cinnamon, cloves, nutmeg, ginger, and pepper add interesting balancing notes in a subtle way indicative of Moroccan cuisine. As Paula Wofert explains in the book, "Moroccans put so many spices in their dishes, yet the spicing is never over-the-top." I first came across Karen Page and Andrew Dornenburg's work many years ago when I happened to pull an interesting-sounding book off the shelf while casually browsing in a book store. Culinary Artistry is the first book that I'd ever come across that gave me a little clue as to how chefs go about creating dishes, combining ingredients, and defining their personal culinary style. Culinary Artistry quickly became an indispensable kitchen tool as I started to play with recipes and discover my culinary creativity. Focusing on flavors that match, marry, and get along swimmingly; Culinary Artistry is filled with lists of ingredients, advise from chefs, sample menus, recipes and all kinds of wisdom that kept me from running off in the ditch and creating fusion-disasters of my own that I would've likely never lived down. In 2008 something great happened. The dynamic Dornenburg-Page duo published The Flavor Bible; evolving the concepts in Culinary Artistry into a full-on flavor encyclopedia. Since bringing the book home two years ago, it's never been put away on a bookshelf. It lives on the kitchen counter. It's also one of the books I've included in Essential References. The entry for cinnamon has 100 items listed from ingredients to cuisines to spice blends, all nominated by expert palates, essentially vouching that these flavors and applications are tried and tested happy matches for cinnamon. Turning to The Flavor Bible for proof, there's no question that cinnamon can play on the savory side of food as well as any other spice. As flavor experts it's only natural that they would turn their skills to the often intimidating and certainly controversial topic of food and beverage pairing. In their book, What to Drink with What You Eat they have once again turned to the thought-leaders in the world of libations and created another interesting and informative resource. It's also available as an iPhone app!